Walmart Inc. is taking a toll on profit. posted fourth-quarter earnings that fell short of analysts’ estimates as the retailer ramps up spending, sending the shares down the most in almost four months. The key expenses include delivery of online orders — part of its push to catch up in e-commerce — and higher wages for employees. The results threaten to renew the debate over whether a $7 billion turnaround plan by Chief Executive Officer Brian Cornell is coming at too high a price. While new brands and store remodels have helped revive the retailer’s “Tar-zhay” cachet, the investments are squeezing profits. And the company has been further constrained in recent months by a wage hike in October, with plans for another one this spring. “I think people have major concerns that the investments aren’t going away anytime soon and will continue to weigh on profitability,” said Brian Yarbrough, an analyst at Edward Jones. heating up for the nation’s largest retailers. The announcements sent shares down as much as 6.9 percent to $69.94 on Tuesday — the lowest since Nov. 15. Target had been up 15 percent this year through Monday’s close. Simeon Gutman, an analyst with Morgan Stanley, said it “remains to be seen” whether Target can boost sales while simultaneously improving profitability. “We are skeptical both can be accomplished,” he said in a research note. The Minneapolis-based company plans to give more information at its annual investor presentation later on Tuesday. A long and cutthroat holiday season also may have hurt profit because of the heavy discounting, said Moody’s Corp. analyst Charlie O’Shea. Though Target’s various investments had the biggest effect on profitability, “the promotional environment, particularly during an elongated holiday season, had a bearing on margins as well,” he said in a note. 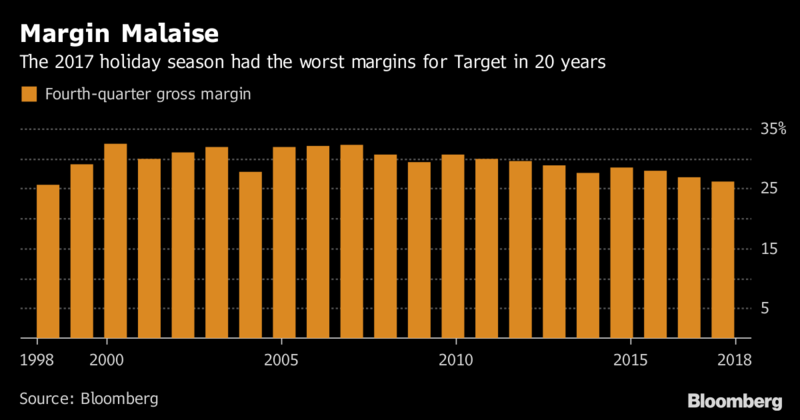 While Target said it was able to offset the impact of holiday deals with cost cuts, its fourth-quarter gross margins still fell to their lowest level in 20 years. Increased transportation costs for all retailers could crimp margins as well, according to UBS analyst Michael Lasser. The good news is Target’s sales are improving, helped by stronger traffic in stores and online. On a comparable basis, they grew 3.6 percent last quarter — better than the 3.4 percent estimate. Profit came in at $1.37 a share during the period, excluding some items, a cent shy of Wall Street projections. Target expects adjusted earnings of $5.15 to $5.45 a share this year, reiterating a forecast it delivered in January. The Minneapolis-based company plans to give more information at its annual investor presentation later on Tuesday. Amazon poses a particular threat to Target. The overlap between Target’s core shoppers and membership in Amazon’s Prime loyalty program is higher than for many other retailers, according to Magid, a consulting firm. But Target’s longtime foe Walmart isn’t standing still either. It recently made a bigger push into apparel and home decor, two of Target’s most important categories. As part of its overhaul, Target is remodeling hundreds of stores and introducing new private brands in key categories like apparel and home decor — the latest is Opalhouse, a collection of 1,300 items including bedding and bath items. It also has acquired logistics specialists Shipt and Grand Junction to speed the rollout of same-day deliveries, which will expand from New York to Boston, Chicago, San Francisco and Washington this year. The pace of investment in its stores and supply-chain network won’t slow anytime soon. Before its investor presentation, the company unveiled some technology projects it has in the works, including a system to use store security cameras to detect out-of-stock products. Target is also developing an augmented-reality program that lets shoppers use their smartphones to see how household goods — for example, a lamp and a coffee table — would look in their home. Or shoppers can use the program to virtually try on apparel. Meanwhile, customers that use Target’s Restock program for delivery of everyday items can now make orders by voice via Google’s home assistant. The retailer is also expanding its curbside pickup service to about 1,000 stores by the end of 2018. Walmart is also betting on curbside pickup, and will offer it at about 2,000 stores over the same period. “I think the investments into technology are a never-ending cycle as all these retailers have to continue chasing Amazon,” Yarbrough said.